Like many busy people, I am irrevocably drawn to the concept of the one-pan dinner, so much so that I am crafting this recipe series about it. But why exactly? What is so irrevocably appealing about making dinner in a single pan? To find out, I turned to the person who has created a cottage industry out of this concept: Carla Snyder. She recently released the fabulous cookbook One Pan, Whole Family: More than 70 Complete Weeknight Meals, following up on her previous volume One Pan, Two Plates. 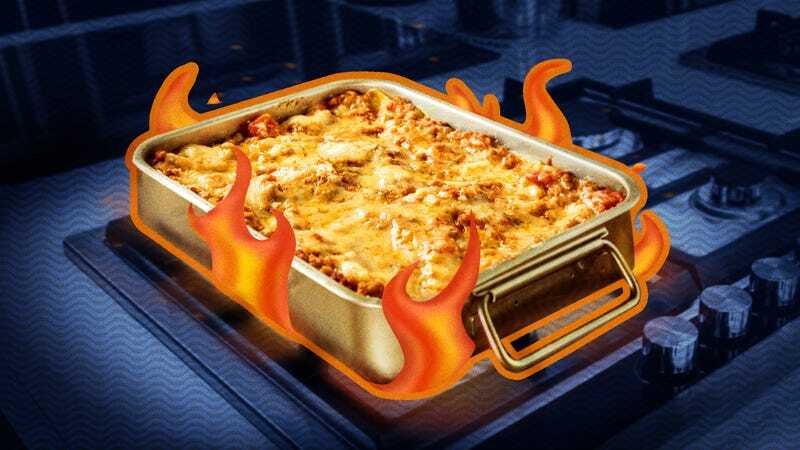 I pretty much want to make everything in One Pan, Whole Family, especially Snyder’s Stovetop Lasagna, since I love lasagna as much as a certain cat who hates Mondays does, but I am loathe to undertake the various filling-mixing and noodle-wrangling that goes with it. But first, I asked her what the one-pan draw was. Snyder posits that there are two parts to the one-pan love: “The first thing is that there is obviously only one pan to clean up. I really like to cook, but I hate to clean up, so how much do people who don’t even like to cook hate to clean up?” It’s true that streamlining your dinner into one pan pares down on your cleanup time, eliminating the most painful part of the meal for some. Snyder is absolutely right: I can’t even think of a recent recipe addition introduced to my family that was more successful than this one. Even my daughter, previously outed in this space as a picky eater, demolished this lasagna, and my frequently critiquing chef-like husband was also a fan. The kids happily ate everything up like it didn’t even have spinach in it. I have reproduced Snyder’s recipe faithfully below, but I added some oregano and cinnamon to the sauce in accordance with my over-seasoning tendencies. Also watch your cooking time: Since the dish all cooks on the stovetop, it can easily scorch on the bottom if it cooks for too long, and it’ll be hard to tell until it’s too late. By all accounts, this meal was a rousing success, that I pulled off (with cleanup) in under an hour. I can hardly wait to try out other recipes in Carla Snyder’s book. I think people are so desperate for easy weeknight dinners because those Monday and Tuesday nights offer a welcome respite for everyone to hang out and talk about their day: At my house we frequently play the “High-Low” game, talking about the best and worst parts of the previous 20 hours. Also, “Name That Superhero.” Easy, delicious dinners like this one make that crucial hour more easily attainable. After all, as Snyder suggests, “You should cook more nights of the week than you don’t.” Stovetop lasagna makes cooking-at-home night a meal you’ll definitely look forward to. On a large cutting board, chop the onion and mince the garlic. Heat a 12-inch skillet over medium-high heat and add the olive oil. When the oil shimmers, add the onion and sauté until it begins to soften, about one minute. Add the garlic, meatloaf mix, teaspoon of salt, and a few grinds of pepper, breaking the meat into small pieces with a spatula as it cooks. Cook until the meat is no longer pink. Add the spinach in two batches, turning with tongs until it wilts, about one minute. Stir in the sauce, brith, ricotta cheese, and red pepper flakes, if using. Stir and bring to a boil. Taste and adjust the seasoning with more salt, pepper, or pepper flakes. Remove from the heat. Transfer two-thirds of the meat mixture to a medium bowl, Lay three of the noodles in the pan, breaking them up to fit so it covers the sauce left in the pan. Cover with half the sauce and the remaining three noodles. To with the remaining sauce, pushing the noodles down into the sauce so that they are covered. Sprinkle with the mozzarella and Parmesan cheeses. Cover and return the pan to medium-low or low heat. Simmer until the noodles are tender, about 15 minutes. Serve hot on heated plates sprinkled with basil.